H-IIA, making its second launch of the year, fired up its cryogenic main engine and twin Solid Rocket Boosters at 6:20 UTC, 3:20 p.m. local time to begin a 28-minute flight to a highly elliptical Geostationary Transfer Orbit from where the 3,500 Kilogram satellite can maneuver to its high-altitude perch where it will capture a multi-wavelength picture of the entire visible globe every ten minutes. 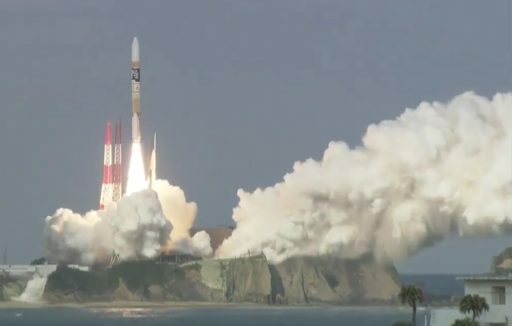 Screaming way from the southern tip of Tanegashima Island, the 53-meter tall H-IIA swung onto a south-easterly flight path, dropped its boosters a little over 100 seconds into the flight and continued firing its cryogenic core stage until hitting the six-and-a-half minute mark. With the second stage in charge of powered flight, H-IIA first inserted itself into a Parking Orbit before firing the LE-5B engine again to raise the orbit’s high point to nearly 36,000 Kilometers. 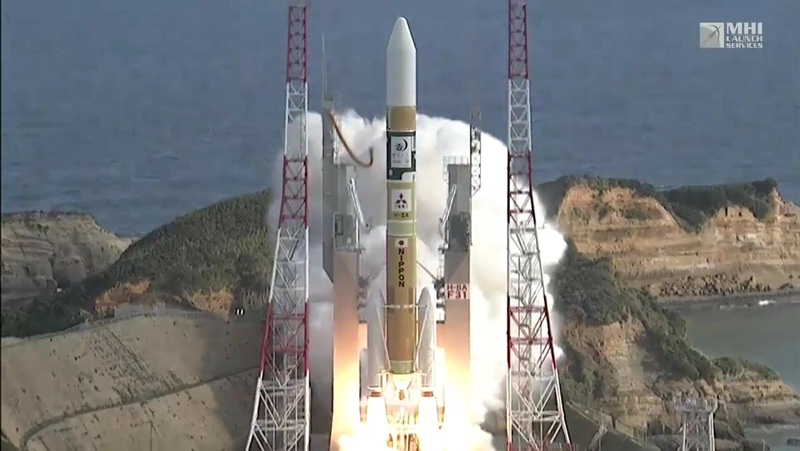 Himawari-9 was sent on its way just under 28 minutes after liftoff to begin a mission of at least 15 years, replacing the aging Himawari-6 satellite launched in 2005 and joining Himawari-8 to build a two-satellite system with each satellite backing up the other to guarantee a maximum possible uptime – required due to the vital nature of the measurements the two provide. Stationed at 140 degrees East in GEO, the Himawari duo collects imagery of the full disk of Earth every ten minutes plus smaller frames covering the Japanese territory and other areas of interest every 2.5 minutes. 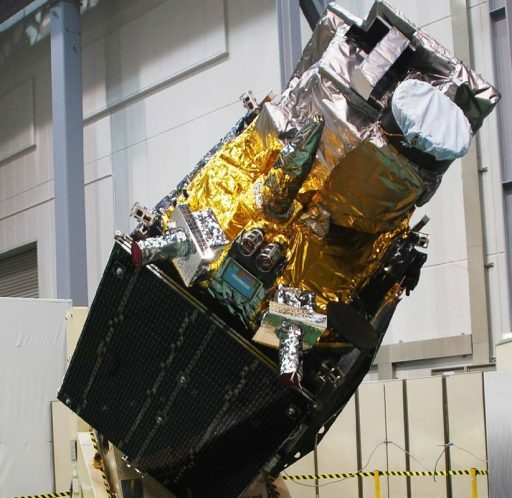 The two satellites are carbon copies, both were ordered by the Japanese government from Mitsubishi Electric in 2009, using the flight-proven DS-2000 satellite platform. The third generation Himawari satellites, at the moment, are the most advanced Geostationary Weather Satellites in the world – employing the Advanced Himawari Imager as their prime instrument, covering 16 spectral bands in the visible and infrared wavelengths at a ground resolution of 0.5 to 2.0 Kilometers. 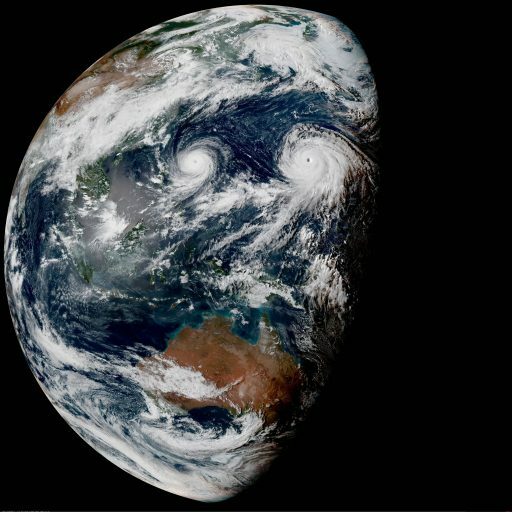 The GOES-R-class satellites operated by NASA and NOAA – set to make their debut later this month – will match Himawari’s spectral coverage and resolution, but surpass its image acquisition, generating a global picture every five minutes. Imaging in 16 spectral bands will not only allow the generation of composite color images, but also provide data on cloud distribution and properties, atmospheric and surface temperature, turbulence, aerosols, ozone and a number of other relevant factors for weather now- and forecasting as well as other applications such as environmental and vegetation monitoring. Himawari Data is used by a number of international customers in the Asia Pacific Region covered within the satellite’s footprint. Auxiliary payloads of the Himawari twins are a radiation monitor to track the radiation environment in the Geostationary Orbit regime and a Data Collection System platform that accepts the data uplinked by remote weather stations, sea-state platforms and other deployed systems for downlink and distribution to users. 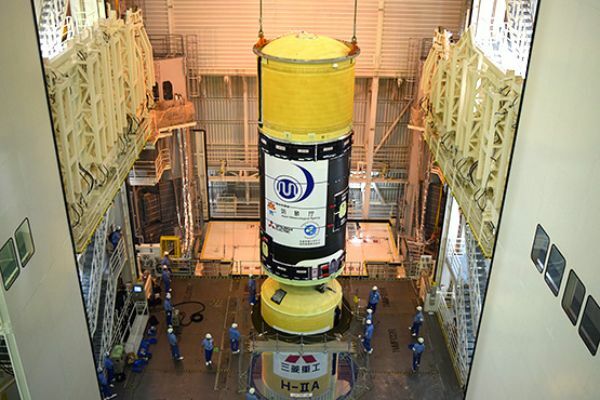 H-IIA moved into Countdown Operations at 16:30 UTC on Tuesday when the launch vehicle emerged from its Assembly Building for a half-hour trip to the picturesque launch pad where it was connected to propellant and other ground systems to clear the way for power-up of the rocket and the start of propellant loading at 21:21 UTC. Over the course of a four-hour sequence, the two-stage rocket received 120 metric tons of supercold -183°C Liquid Oxygen and -253°C Liquid Hydrogen propellants before tanking entered topping to keep both stages at flight level until the last minutes of the countdown. With the rocket tanked, the launch team proceeded with a multi-hour testing sequence to ensure H-IIA was fully operational for its flight, being put through communication checks, flight slews of the engines and flight control system tests. 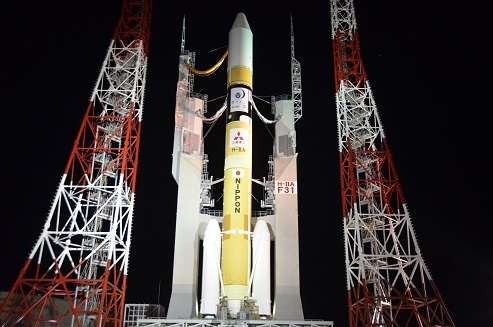 In the last hour of the count, H-IIA received its flight software, teams verified weather was within the launch criteria and Himawari-9 was readied for its climb to orbit by switching to battery power and launch mode. Computers were handed control at X-4 minutes and 30 seconds, kicking off a highly choreographed sequence of steps to put H-IIA into a fully autonomous flight configuration. Tanks on both stages were topped up and entered pressurization while the H-IIA made its transition to onboard power and the launch pad’s sound suppression system was activated. Thermal batteries on the boosters activated in the last minutes of the countdown for a thrust vector control check followed by the arming of pyrotechnics and the handoff from ground to launch vehicle computers. Flames erupted from the base of the rocket when, at X-5.2 seconds, the LE-7A engine opened its propellant valves and spun up its turbopumps to reach a total thrust of 86,000 Kilogram-force – its ignition carefully monitored by computers to ensure the engine was up and running before the boosters were fired, marking the point of no return for the H-IIA. H-IIA leapt off its pad upon ignition of the twin boosters, making an on-time liftoff at 6:20:00 UTC with a total thrust of 685 metric-ton force, creating a thrust-to-weight ratio of 2.4 which makes for a very fast initial climb. The familiar scream unique to the H-II rocket series was heard across the Tanegashima Space Center as the vehicle pitched and rolled onto a south-easterly course toward Geostationary Transfer Orbit. 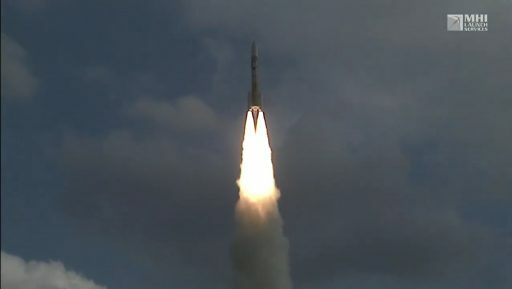 Burning 1,600 Kilograms of propellants per second, H-IIA passed the sound barrier one minute after liftoff followed by Maximum Dynamic Pressure a few seconds later. Over the course of the initial flight phase, the twin boosters delivered 80% of the vehicle’s total thrust, helping accelerate H-IIA to a speed of 1.5 Kilometers per second. For GTO missions, H-IIA flies with SRB-A3 boosters that have a higher thrust and shorter burn time than the conventional SRB-As. Each of the two 15-meter long boosters generated a thrust of 281 metric ton-force for a 92-second burn prior to thrust tailoff. Burnout of the boosters was sensed by their declining chamber pressure, triggering the Flight Control System to initiate the separation 107 seconds into the flight at an altitude of 54 Kilometers. With the two boosters cleanly separating, H-IIA headed on toward orbit powered by the LE-7A engine alone, guzzling down 260 Kilograms of cryogenics per second to output a thrust of 109 metric ton force when flying through the thin upper atmosphere. 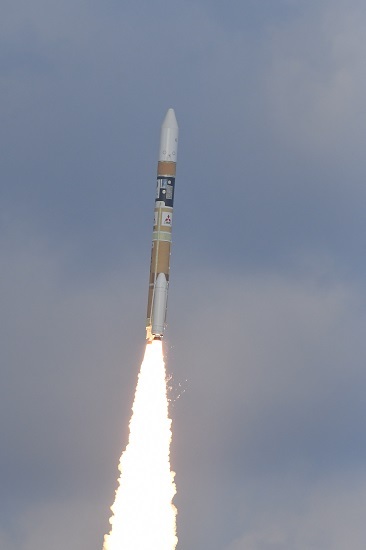 By X+4 minutes, H-IIA had crossed 140 Kilometers in altitude and commanded its fairing halves to split open and separate to rid itself of no-longer-needed weight, revealing the Himawari 9 satellite for the rest of its journey into orbit. The first stage finished its job six minutes and 30 seconds into the mission, shutting down its LE-7A engine after boosting the stack to a speed of 5.3 Kilometers per second. Next, the 37.2-meter long first stage dropped away from the upper stage to hand powered flight duties off to the LE-5B engine tasked with a pair of burns to lift the satellite to Geostationary Transfer Orbit. Firing up its 14,000 Kilogram-force LE-5B, the second stage continued on a south-easterly trek to head into a 265-Kilometer Parking Orbit. The first burn lasted five minutes and 18 seconds, raising the vehicle’s velocity by 2.4 Kilometers per second to reach the proper orbit. Shutdown of the second stage occurred just after X+12 minutes and marked the start of an 11.5-minute coast to allow the vehicle to proceed toward the equator so that the second burn could raise the high point of the orbit to a position above the equator to ease the process of maneuvering the satellite into Geostationary Orbit. Re-Start of the upper stage was confirmed just shy of X+24 minutes with the engine firing for three and a quarter minutes to increase the spacecraft’s speed by 2.5km/s in order to place the satellite into a target orbit of 250 by 35,976 Kilometers, inclined 22°. Successfully concluding the propulsive phase of the flight right at the 27-minute mark, the upper stage reduced body rates to set up for the separation of the Himawari satellite less than one minute later. Sent off after a seemingly flawless ascent, Himawari-9 will begin raising its orbit in the coming days to reach Geostationary Orbit co-located with Himawari-8. 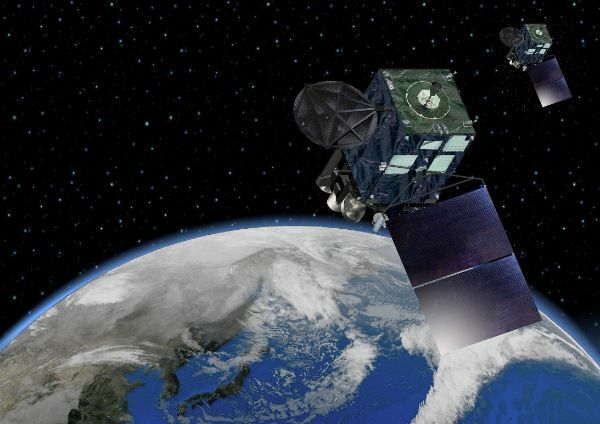 Several weeks of checkouts and commissioning activities are planned for the satellite before being transitioned into active service to reinforce Japan’s weather satellite fleet.